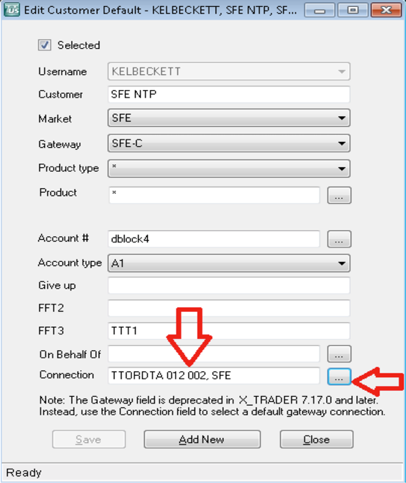 Once your Customer Defaults have been copied across to SFE-C, the Connection field within Customer Defaults also needs to be manually updated. Check whether ‘connection’ is used. If so, update to SFE-C/D. In Tt User Setup control panel, click | User Admin | X_TRADER Customer Defaults. Click button next to ‘Connection’ field. Select ‘SFE-C’ MGT and click ‘Select’. Click ‘Save’. You should now see ‘SFE-C’ in the 'Conn Gateway' column.